It's that time again, summer is winding down, fall activities and schedules are at the forefront of our thoughts. It's almost time for cooler weather, hay rides, apple and pumpkin picking, and to go back -- to school! 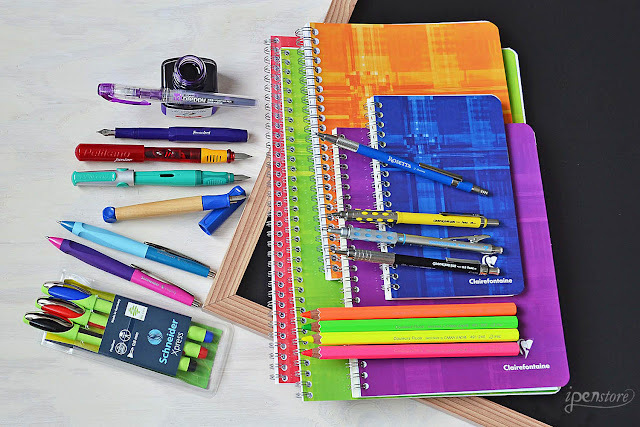 There's nothing better than school supplies, so we chose some of our favorites to get you in the spirit of Back-to-School fun! 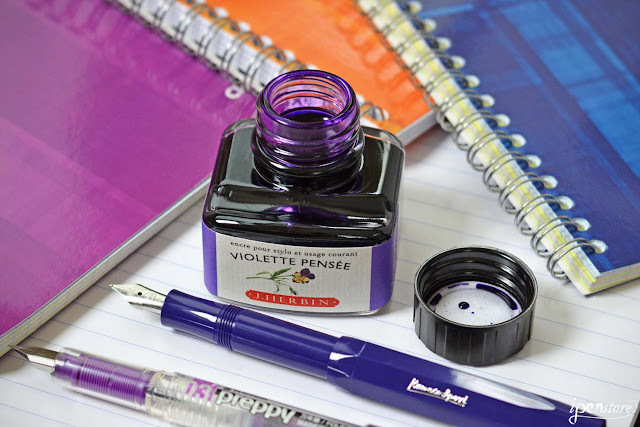 Violette Pensee is the perfect back to school ink, because it's the standard ink that French schoolchildren used in the 19th and 20th centuries. 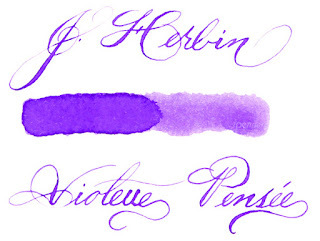 It's a beautiful tender purple ink. It falls on the blue end of the purple spectrum. Fountain pens are making a comeback for students- young and old- these days and we are featuring these four as our favorites. Pelikano- Same great features as the Pelikano Junior- only slightly larger! The Pelikan Pelikano fountain pen has a soft grip for relaxed writing. Features include stainless steel nib and transparent front part with ink controlled window. One of the best-selling pens in the world. Lamy ABC- The Lamy ABC fountain pen was by education experts for the first steps in learning to write. The special design helps meet the needs of children with the ergonomically shaped grip providing a natural, relaxed position for the fingers. Made of maple wood and plastic with a non-slip rubberized grip. The nib is an 'A" medium nib- which means it's similar to a medium nib, but with a more rounded surface making it more tolerant of different writing angles. Great for the beginning fountain pen writer. This pen comes in blue or red! Platinum Preppy- This clear barrel cartridge fill fountain pen is a favorite for many reasons: It comes in eight fun colors- the color-keyed trims match the ink cartridge color. It comes in three nib choices- fine, extra fine, and medium. The cap mechanism keeps the pen from drying out. Best of all is the price - less than $5. 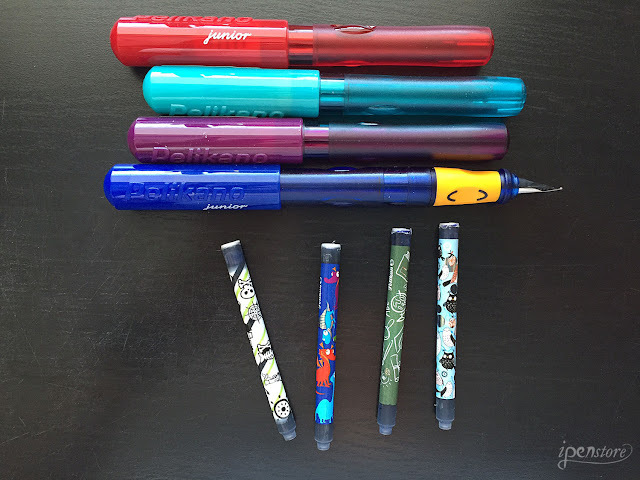 The Pelikano Jr.- ideal for students just beginning to learn to write. The sturdy stainless steel nib is an "A" size (close to a medium). The grip is soft and rubbery and the cap is designed to keep the pen from rolling off the desk. This pen is available in both Left Handed and Right Handed (the grip section is different for lefties or righties). The cutest part? The fun looking Pelikan ink cartridges that come in the pen. Clairefontaine paper is extremely fountain pen friendly! 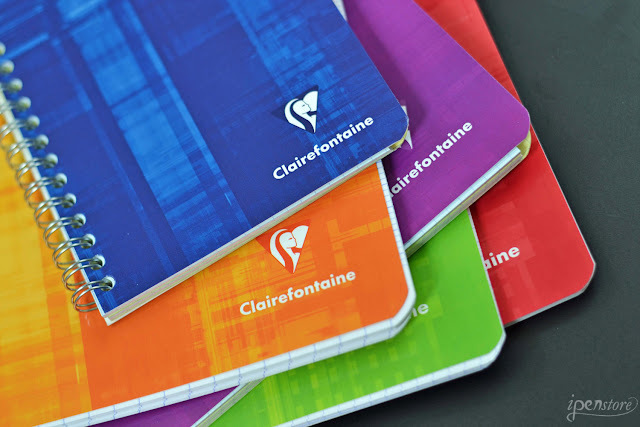 Clairefontaine paper is known as the best paper in the world. The paper is extremely high quality, thick, an satiny-smooth. The paper can handle anything from permanent markers to a bold nib fountain pen without bleed through or feathering. The paper is very fountain pen friendly - your nib will glide over the paper! The paper is useful for learning cursive, and is an excellent tool for anyone aiming to improve their handwriting or practice calligraphy. It is also very useful for making charts and graphs, taking notes, and drawing. 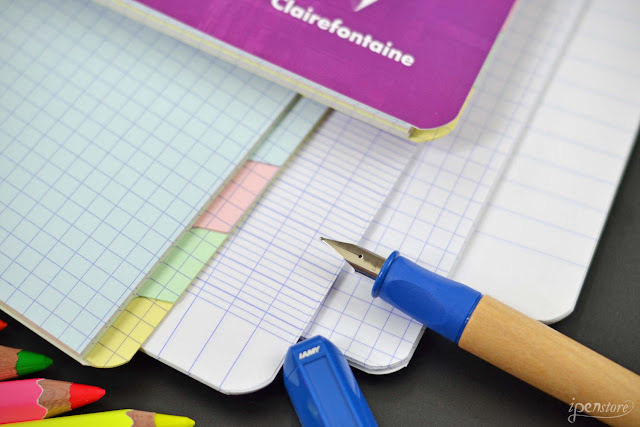 If you haven't tried French ruled paper before, give it a shot! We think you might enjoy it! 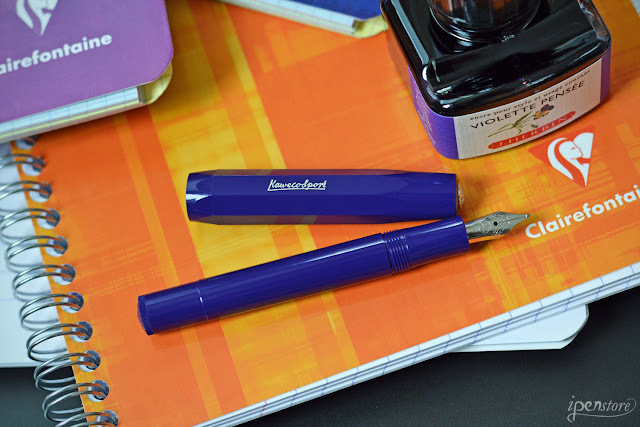 The Kaweco Skyline Sport in Royal Purple is the perfect match to the J. Herbin Violette Pensee fountain pen ink. The Skyline Sport closely follows an original 1935 Kaweco octagonal design. The compact size of this pen capped is just 4 inches long- just right for a pocket in a backpack. It's made from tough, but lightweight plastic. The cap screws securely on to close the pen and protect your pocket and the nib. The German-made nib is polished stainless steel and extremely smooth- no skipping while you're taking those lecture notes! 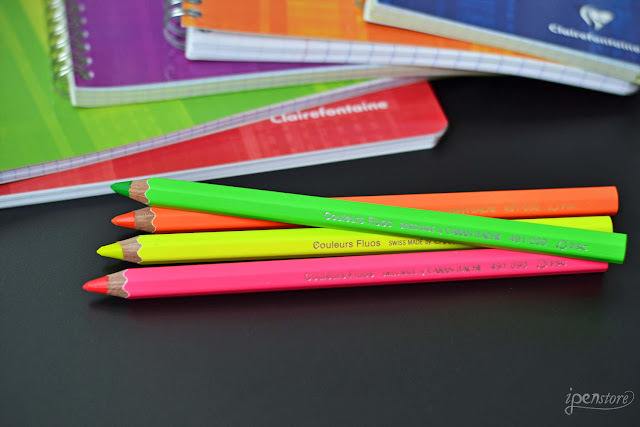 Our best selling Caran d'Ache Colorblock pencils have super-smooth lead and ultra bright colors that are perfect for marking or highlighting. They are just as great for artists for drawing, building up colors, decorating or scrap-booking. These large 10 mm diameter hexagon shaped pencils are easy to hold in your hand. The extra large 4.5 mm lead is wax-based to provide a smooth, generous application of the brilliant color. 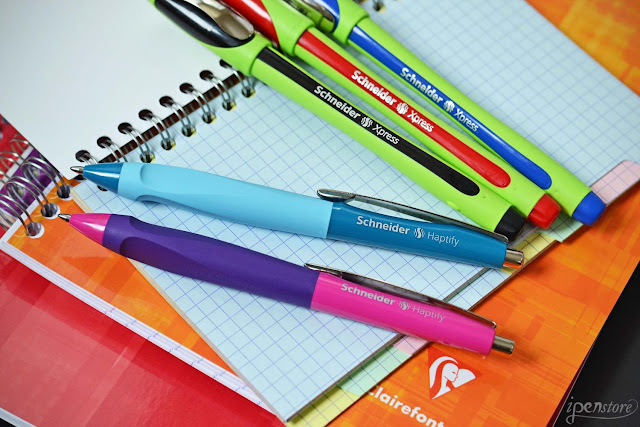 Schneider Haptify and Xpress pens are perfect for both students and teachers! Schneider Haptify pens are best sellers at iPenstore because of the ergonomically shaped writing grip. Haptify is a comfortable refillable and retractable ballpoint pen with an ergonomic grip design that produces a pleasant and gliding writing experience. Schneider Xpress Fineliner pens have premium porous-point tops for exceptionally smooth writing. The ergonomic rubber barrel means that is lies comfortable and securely in your hand. The ink is waterproof to ISO 14145-2, and the tip will not dry up if the cap is left off for several days. Are you looking for a great, reliable pencil? The Pentel GraphGear mechanical drafting pencil is made for precision drafting and drawing. 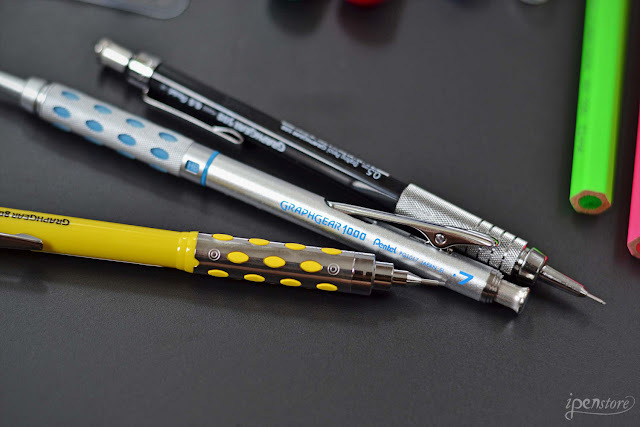 We stock the GraphGear in 4 different lead sizes (0.3, 0.5, 0.7, and 0.9 mm), and 3 different styles (the 500, 800, and 1000). The GraphGear 500 features a knurled grip, the grip on the 800 is inlaid with soft latex free pads to cushion fingertips, and the 1000 combines both into an excellent, comfortable grip. Need refills for your mechanical pencils? We stock a huge assortment of Pentel Super Hi-Polymer leads. Did you know iPenstore offers mechanical pencils with larger lead sizes than the standard 0.3-0.9 mm? 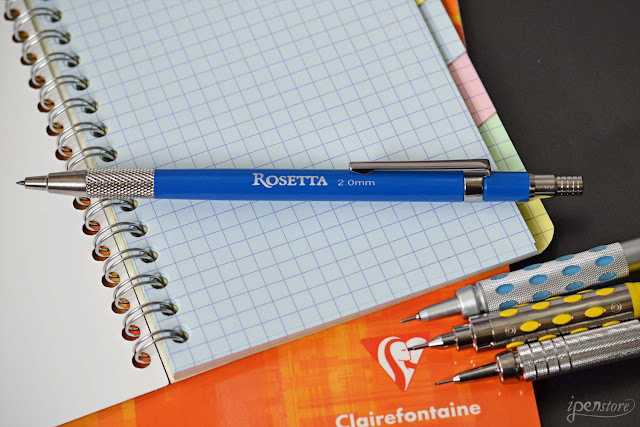 Check out a Rosetta Da Vinci 2.0 mm mechanical pencil. The Da Vinci features thick 2.0 mm lead, which wont break easily. The pencil is perfect for younger students, but also works great for professionals as well. This pencil features a knurled grip, a brass barrel, and a sharpener built into the end cap. We also have additional 2.0 mm leads in HB, 2B, or 4B, and a full assortment of colored leads to fit this pencil available for sale on www.ipenstore.com. These are just a few of our back-to-school favorites, but there are many more available on iPenstore.com. 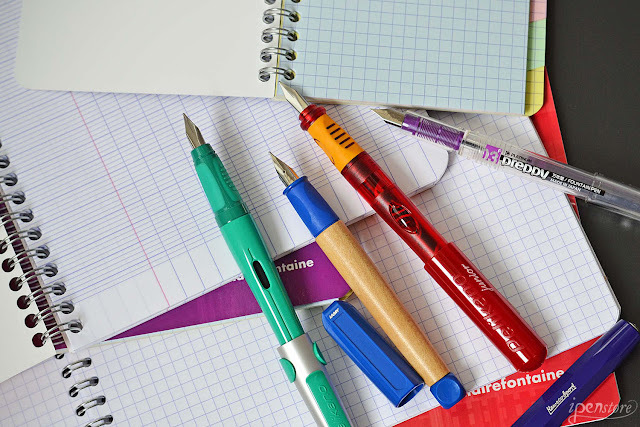 Do you have a pen, pencil or paper that you need to have in order to make the grade? Let us know in the comments!